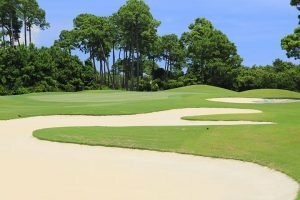 Orange Beach offers some fabulous golf courses for those staying at Turquoise Place and needing a little extracurricular fun. Bring your sticks and check out the great golf in Orange Beach on your fall beach trip when the weather is near perfect. There are numerous driving ranges and practice facilities, and most clubs have onsite PGA pros who offer lessons to fine-tune your game. Of course, the views are pretty spectacular too! Golf in Orange Beach is ideal during the fall. Newbie golfers can enjoy course choices that are sure to help develop skills while also challenging more seasoned golfers. 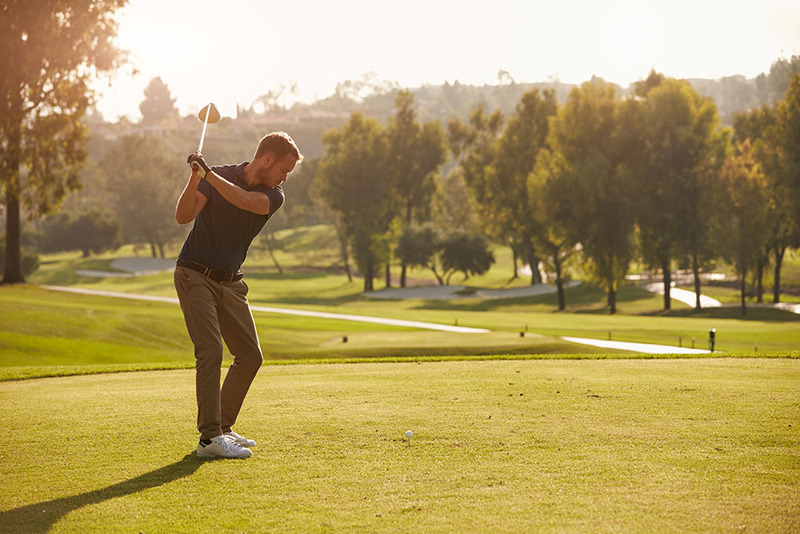 It’s easier to grab a golf lesson during the fall when visitors are fewer, and the best practice of all — playing an actual course — is always doable during the shoulder seasons. A great place to hone your golf skills is the Orange Beach Golf Center & Driving Range featuring a 9-hole, par-3 course with a lighted driving range, practice facilities (putting, chipping, sand bunker, etc.) and Pro Shop. The Golf Center is open seven days a week and the driving range offers 30 grass tees as well as 10 covered mat tees. Golf in Orange Beach prices are affordable at $3/per bucket with 34 balls in each bucket. Ball dispensers are self-serve (machine accepts $1 bills, credit cards or tokens) for your convenience. Lost Key Golf Club was built in 1997 by the Arnold Palmer Design Company, then redesigned in 2005. The unique and unusual traits of this golf course are quickly evident starting with the name, earned honestly. Each hole offers six sets of tees, so all skill levels are able to play competitively on the 18-hole, par-71 course. Water, wind and other vegetation claims many a ball at Lost Key, hence the name, but it’s an exciting course for all who play nonetheless. After your round, enjoy the clubhouse with golf shop and locker rooms, grab a bite to eat at the restaurant and bar or just sit outside and take it all in with panoramic course views. Craft Farms features 36 holes of championship golf. Cotton Creek and Cypress Bend each offer a challenging, but fair, 18-holes. Both courses are signature Arnold Palmer golf courses and are the only two courses in Alabama designed by the legend himself. Each course boasts scenic and peaceful views of surrounding Baldwin County Alabama, with lush greens and various water features that fill the course. For rates, tee times, and specials, call ahead. Perdido Bay Golf Club was originally designed in 1963 by Bill Amick and redesigned in 2001 by Bill Bergin as an 18-hole, par-72 course. Start out on the practice range, putting green, chipping green, greenside bunker and fairway bunker, then meander your way through this tournament-quality championship course. Don’t miss the Legends Bar & Grille for some tasty eats and your favorite beverage following your day playing at Perdido Bay Golf Club. The Peninsula Golf and Racquet Club offers three 9-hole courses within one venue. Each distinct Earl Stone-designed course plays with its own challenges and sprawls along Mobile Bay. Rated 4 ½ stars by Golf Digest, golfers enjoy all three courses equally: Marsh, Lakes and Cypress. Other venue amenities include the clubhouse (recently remodeled), bar and restaurant, tennis courts, fitness center, and indoor/outdoor pools. For savings opportunities, be sure and check out the SPECIAL OFFERS tab on the website. The award-winning Kiva Dunes Golf Club is less than 30 minutes from Turquoise Place and is stunning in both design and setting. Located beachside along the Fort Morgan Peninsula of Gulf Shores, Kiva Dunes is Alabama’s number one ranked golf resort. The latest renovation was completed in 2015 on the championship course developed by Jim Edgemon and U.S. Open champion Jerry Pate making it more playable for average golfers. Need a lesson? No problem! Rea Schuessler is the resident PGA instructor with more than 25 years of experience. Also, golfers can work more extensively on their individual games by utilizing the full-service, full-swing practice facility. Additional amenities at Kiva Dunes include the clubhouse, fitness center and Kiva Beach Club. Call for tee times, specials and daily rates. Fall is fantastic for golf in the Orange Beach area. With temperatures slightly cooler and a less crowded atmosphere, why not book a relaxing getaway at Turquoise Place this year. . .and don’t forget those clubs!